So I’ve launched a podcast, something I’ve been bouncing around in my head for a while. These are conversations dedicated to the overanalysis of films made for children. So far, they are a lot of fun to record, and I hope they are a lot of fun to listen to. I’ve launched with two episodes. I want to ask you for a favor. Please listen to one or both episodes, and then leave an honest review on iTunes. I’ll take feedback very seriously. I plan do release a new one every 2 weeks. You can visit the podcast website for more details and to subscribe, plus some shows notes about each episode. The seed of this story popped into my head after I read What Do You Do With an Idea? and was left in awe of the artwork. Then I remembered that Darlene had done sketches of a similar style for Princess Hiccup, when crafting the initial designs of the characters. Wouldn’t it be great to put together a book with such gorgeous artwork? 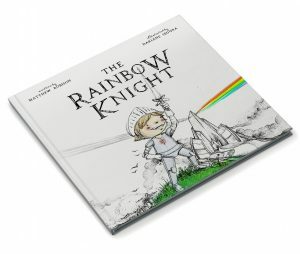 Add in a dash of inspiration from my children, reciting the colors of the rainbow, and you get The Rainbow Knight. Some parts of this book surprised me. It was going to be a basic story about gathering some common items, but then, on a lark, one of the items became a living butterfly. And not just any butterfly: the Emperor of Kaleidoscopes*. A king of kings, if you will. It was an emotional punch I hadn’t expected. It became the hinge of the whole story, its beating heart. I fell in love with a blue butterfly. That’s not something I deliberately set out to do. Don’t get me wrong. Overall, this is still a goofy, light-hearted story. It also features an arrogant parrot and a hipster witch involved in artisanal jam-making, so please don’t take it too seriously. But the depth is there for those who want to see it. You always hear of writers being surprised by what their characters do, and about how the story unfolds in ways they never expected. I gave superficial assent to the fact, but never really believed it in my bones. Now, after two books, I understand it. And I’m grateful for it. Please help bring The Rainbow Knight to life. Please help tell the butterfly king’s story. And in so doing, perhaps help hint at the life of another sacrificial king, whose actions form the hinge of the Greatest Story. *A kaleidoscope is defined as a group of butterflies, one of those true English gems. It is a perfect word. I’m a discovery writer, and I just have to live with it. This comes from me being a “thinking slow” person, which might also be related to me being an introvert. It comes out in many different ways. Let me explain. I don’t feel comfortable speaking on a subject until I’ve thought about it. And thought about it. And then thought about it some more. And then I want to work out exactly how I want to say it. In fact, I don’t even know what I think until I’ve gone through the process of writing it down. This blog post, for instance, started with a seed. I think I know what I want to say on this topic, but I’m not really convinced, and by the time I’ve gotten to the end, I might have changed my mind. My thoughts, anything beyond “I’m hungry” or “I like that,” don’t coalesce or get ordered until they have been written down. If I am doing a new speech in public, like a sermon or presentation, I have to write down everything single word that I think I’m going to say. The process is required. If I am writing a story, I can’t plan out things in advance. It never works. I either get frustrated or distracted, or frustrated that I’m distracted. I have some seeds, typically the beginning and the end, but I have no idea how I am going to connect those dots until I start writing. Take Princess Hiccup, for example. I knew there would be a princess cursed with hiccups by a dragon, and that a boy would need to defeat that dragon. I honestly had no idea how the lad would actually accomplish the feat, and my mind was blank all the way to the point where I began writing those scenes. It just hit me in the flow of the moment. There are moments in the book that probably surprised me just as much as they surprised you. If I speak quickly about something that sounds deep and thoughtful and off the cuff…worry not. It’s just an illusion. You can be sure that somewhere, at some time, I’ve taken the time to write down something about it. My memory is pretty good, but it takes a while to build it up so it’s as accessible as a computer’s RAM. It seems daily journaling would be a beneficial habit for me…but alas, it never catches on. Because while I don’t know exactly what I think until I write it down, I’ don’t get motivated to write anything down until I’ve sat on it, chewed on it, and perhaps even had the chance to dream on it. Maybe I need to think about a bunch of other related (or seemingly unrelated) things first. It’s sort of annoying. Notice the sporadic posting schedule of this blog? My grand total of two movie reviews over on Medium? Anyway, I’ve come to accept that this is how I work, and more importantly, its how I put out my best work. I don’t think I will ever be prolific. And that’s OK. If this has resonated with you in any way, what does that mean? It means you should write. Think you have writers block? It means you should write. Have a problem you can’t solve? Write it out. Ever had a moment when you were articulating a problem to someone with the written word, and the solution suddenly came upon you as if it plummeted from several thousand feet in the sky and nailed you right between the eyes? In summary, outlining is for chumps, and everything I learned about writing in public school was a waste of time. Towards the end of last year, I gave Grant Horner’s Bible Reading System a spin. It’s main assumption is that Christians don’t read enough Scripture (true enough), and we are especially unfamiliar with the Old Testament (ditto again). Professor Horner’s prescription is a reading of 10 chapters a day. It seems like a lot, because it is. That’s the whole point. His intention is not that this will replace normal, in-depth Bible study, but provide readers with better context, giving their more in-depth studies greater value. Basically, every book of the Bible is bucketed into one of 10 lists, and every day you read a chapter from each list. The Pentateuch is a list, the Gospels are a list, and the book of Psalms is its own list. When you get to the end of the list, you just start over. You end up reading all of Gospels every 89 days, for example. View a complete rundown here. So I gave it a shot. I got into a rhythm. It took me a total time of 40-50 minutes per day, and I would read half in the morning and half at night before going to bed. Eventually, I took Sunday’s “off,” and made Saturday a “catchup” day. This made the whole thing less intimidating and more enjoyable, but it still ended up being fragile. In November I went to my company retreat, and with the change of my daily routine for the week, my daily reading habit of almost two months was shattered. Even after the trip, I couldn’t get back in the rhythm. It seemed too much. The good news is that I still read 2 chapters a day, and after spending so much time reading 10 chapters per day, 2 chapters felt like nothing at all. At the start of the new year, I wanted to start reading more again, but I knew that it would be just as fragile, and I travel enough that it was a worry. So I tweaked the plan. In the original, both Proverbs and Acts were their own single-book lists. I understand why. These are important books, and Proverbs in particular rewards repeated, constant reading. But they also tend to have the longest chapters and were part of the reason why my readings were taking so long. It made things that much more daunting. So now I try to read 8 chapters per day. This is still a large amount of Scripture, but I feel its much more sustainable, and much less fragile. It now rarely takes me longer than 35 minutes to finish my reading. I might end up moving Acts to the beginning of list 4 after trying this for a while, but we’ll see. If you’re looking for something challenging, and a bit more interesting than your typical yearly Bible reading plan, I’d encourage you to try it out. So I wrote a children’s book, based on a request made by my daughter, and I need your help to make it a reality. I wanted it to be light and fun and silly. And it is all of those things. But I believe it is also true, with a certain gravitas in some scenes, colored by Scripture. This was not my intention, but rather the tones bled into the story as I was writing and editing. The latter is pretty obvious. Ultimately, the Lord is the source of all laughter, the Prime Comedian, the One Author. Satan (that dragon of old) seeks to disrupt it. When you lose joy and laughter, you lose your thankfulness, and your faith will follow close behind them. The verse from Song of Solomon, however, is a bit odd, and it has been translated in many ways. This is said by queens and other maidens, in praise of the woman who is being pursued. It speaks of a special kind of feminine strength, one that is finely honed and directed. It is not the brute, raw strength of masculinity, but it is a true strength. Helen of Troy inspired the launch of an armada, but the woman of the Song can stop an army. Woman is the glory of man (1 Cor. 11:7), and as such a Biblical woman makes possible her husband’s coronation as a king. She helps lift him up so that he might go and do battle. A kingdom, a city, a household with a Biblical queen on the ramparts is a beacon of strength to her king, and a terrible visage to her enemies. One of my favorite authors has been known to say that the point of the Bible is this: “Kill the Dragon, get the girl.” The lad in Princess Hiccup is a carpenter’s son. You are free to make the connection yourself. So not only is this a fun little book that can be read to all ages, its also a little subversive to the culture at large. If you can donate and help make this book a reality, I would really appreciate it. If you can’t donate, you help out tremendously just by sharing the Kickstarter page.